In January, our co-director, John Henneberger, wrote in the Austin American-Statesman about the distressing similarities between Austin’s fair housing battles in the Civil Rights era and today. In 1968, the Austin Apartment Association and other landlord groups stood in strident opposition to a city ordinance that banned racial discrimination in housing. Today, the AAA is the driving force behind a push to overturn a city ordinance that bans discrimination based on a renter’s source of income. Their lawsuit against the City of Austin has been rejected by both the U.S. District Court and the 5th Circuit Court of Appeals. Meanwhile, the AAA and their affiliates at the Texas Apartment Association are leading the fight in the legislature to ban source of income protection statewide. The first such proposal, SB 267, was voted out of committee on Tuesday – with an amendment that would allow Austin’s ordinance to stand via a grandfather clause. The rhetoric that fair housing opponents use has hardly changed since the ’60s. And given that more than 80 percent of Austin’s Housing Choice Voucher holders are people of color, the effect of their opposition today is largely the same as it was back then: to keep minority families out of Austin’s white, higher opportunity neighborhoods. Setting aside that states and municipalities from North Dakota to Oklahoma and in dozens of other places around the country already have source of income protection on the books, and that several courts have already affirmed those ordinances’ constitutionality, Robinson misses the point. Our disappointment in the Austin Apartment Association is not about AAA’s right to go to court or to lobby legislators. The issue is with their reaction to an attempt by the City of Austin to address the reality of discrimination against voucher holders – namely that it perpetuates racial housing segregation. 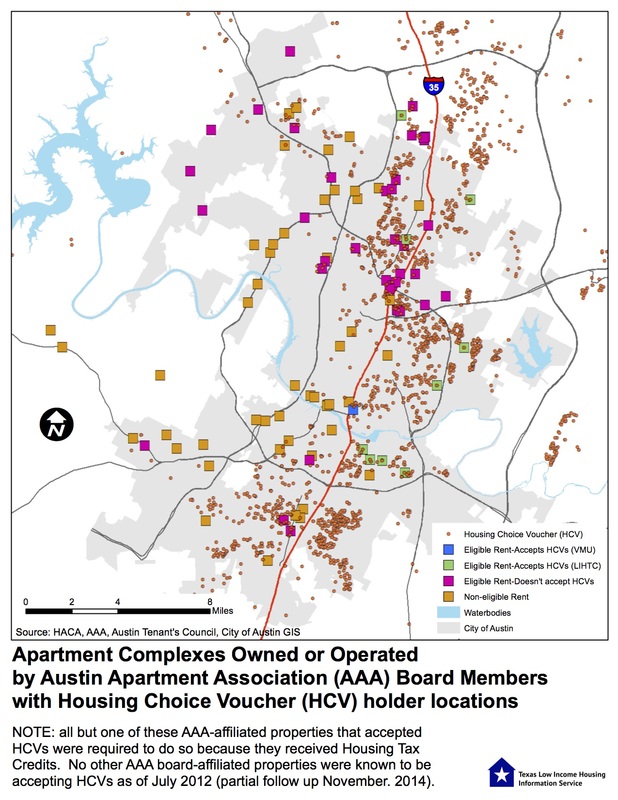 Without source of income protection, there was a stark contrast between the apartment properties owned and managed by the the members of the AAA’s board (squares) and the locations of voucher housing in the Austin area (circles). The vast majority of the properties that are owned or managed by AAA board members are located in the predominantly white and higher income neighborhoods of west and northwest Austin. Without source of income protection, the vast majority of voucher holders were shut out from those areas and instead concentrated in higher poverty, lower opportunity neighborhoods east of Interstate 35 or north and south of the city core. At the time of the Tenants’ Council survey, many of the properties owned or managed by AAA board members, shown in orange, were not eligible for housing vouchers because their rents were too high. But many others, shown in pink, had eligible rents but refused to accept voucher families. Of the few that did accept voucher holders, shown in green (and mostly located in lower-income areas), almost all did so because they received Low Income Housing Tax Credits, which require owners to accept vouchers. Just one property owned or managed by an AAA board member that was eligible to accept vouchers, shown in blue, did so without being required to. Delving into the data reveals even more about the properties the AAA board members own and manage. Keep in mind that Austin as a whole is about 49 percent white/non-Hispanic. Yet almost half of AAA board member-affiliated properties are located in Census tracts where more than three-quarters of the population is white. A full 86 percent of properties are located in majority white areas. Robbie Robinson herself works for IMT Residential, a national apartment operator based in California. The three Austin properties IMT operates are all located in the northwest Austin area, in and around upscale Jollyville and The Domain. The three Census tracts surrounding the IMT properties are 79 percent, 75 percent and 64 percent white – and just 0.6, 7.8 and 3.3 percent African-American. None of the IMT sites accept housing vouchers. Austin is the most economically segregated city in the country. It is a city with a deep and enduring legacy of racial segregation, where it’s still immensely difficult for a voucher holder to find housing in an integrated, high opportunity neighborhood. Source of income protection is a step toward fixing that problem. AAA’s position does the opposite – it further entrenches the kind of racial concentrations that already exist around most of the properties the association’s board members own and manage. It furthers discrimination, and perpetuates a racially segregated status quo that has existed in Austin for far too long. This entry was posted in Uncategorized and tagged Austin, Austin Apartment Association, source of income. Bookmark the permalink. This sounds to me like economical envy on the voucher holders. Race has nothing to do with your ability to provide housing for yourself or family. The decisions a person makes in life toward education and employment along with work ethic usually determines their economical status. The only racial discrimination I see in this article is the insinuation that a minorty is not intelligent enough to earn sufficient funding to live a desirable lifestyle. If a person wants to live in a particular area that is more expensive, but doesn’t have the capital, then you have to earn more money. That comes from improving a persons work skills and or education. You can’t give a person an economical status, because it will not be appreciated, only squandered. That only comes from hard work and good decisions! This is an interesting article, the city wants to house the low income members of society through an voucher program in which will be paid for by the tax payers. I think, instead of making these luxury apartment facility’s take your voucher applicants if they choose not to, you should some how create an incentive program to lure low income housing developers to your area by perhaps setting aside some property to build on or by waiving the property tax for the first ten years, or maybe even acquiring low to no interest loans for construction and waiving all pertinent permits, fees, etc. And you could even make the city ordinance only affect future developments in the city instead of all previous and future developments, If the city does not reverse there ordinance they could be opening them self up for future litigation and damages by these luxury facility’s and that will also be on the backs of the tax payers once again. The City really needs to re-address this ordinance and roll up there sleeves and get back to work being creative so everybody wins and especially the tax payers !!!!!!!!!! Thank you both for your comments. We urge you to do some additional reading on the relationships between class, race and housing vouchers. The idea that race has nothing to do with finding quality housing is, sadly, untrue. Studies have found significant, ongoing discrimination on the basis of race by housing providers all around the country (http://www.huduser.org/portal/Publications/pdf/HUD-514_HDS2012_execsumm.pdf). Moreover, much of America still suffers from a history of overtly racist housing policies that created our current segregated neighborhoods (http://www.theatlantic.com/business/archive/2014/05/the-racist-housing-policy-that-made-your-neighborhood/371439/). The Austin American-Statesman has extensively investigated how Austin’s legacy of racial segregation still affects where people live in our city (http://projects.statesman.com/news/economic-mobility/index.html). Housing choice vouchers can be a way to break down these enduring racial barriers, by providing families the opportunity to move into more integrated, higher opportunity neighborhoods. But racial discrimination against voucher holders still endures (http://www.wbez.org/news/new-report-reveals-pervasive-discrimination-housing-voucher-program-109946). In Austin’s case, the City saw a problem (more than eight in ten voucher holders are people of color; more than nine in ten eligible landlords refused to accept vouchers – https://texashousers.net/2015/01/29/austin-tenants-council-study-illuminates-source-of-income-discrimination/) and identified source of income protection as a solution to stop this ongoing discrimination. This kind of discrimination harms a city by keeping low-income children of color away from the opportunities afforded in more integrated neighborhoods, as many studies have found (http://www.epi.org/publication/unfinished-march-public-school-segregation/). As U.S. District Court Judge Sam Sparks noted in his rejection of the Austin Apartment Association’s lawsuit against the City of Austin, the source of income protection ordinance “advances an obviously legitimate government interest: ensuring low-income persons – many of whom are racial minorities, children, disabled or elderly – have access to affordable housing (and thus to better schools and safer neighborhoods) throughout the City of Austin” (https://www.scribd.com/fullscreen/257176192?access_key=key-GfRG4vh7mt8Oc2MGDxbU&allow_share=true&escape=false&view_mode=scroll). The Austin Apartment Association’s opposition to source of income protection would serve to keep a racially segregated status quo intact – a status quo that, by and large, the AAA’s board members are comfortable operating in, as our map demonstrates. Rather than support the City’s effort to break down racial barriers with expanded opportunity in housing choice for voucher families, most of whom are minorities, the AAA has taken an active political stance against it. As for the suggestion that the City’s goals would be better met through an incentive program: the AAA has yet to offer any alternative solutions, despite repeated claims that source of income protection is the wrong option. Throughout the months-long process at the local level to draft and pass the source of income protection ordinance – a process in which the AAA actively participated – and continuing through the AAA’s opposition efforts in the courts and at the legislature, we have not heard one suggestion about an incentive program or any other alternative. The AAA has the right to continue to pursue litigation against the City of Austin’s ordinance. But they do so with the knowledge that source of income protection has never been struck down by any court, and that it is currently part of the law in 12 states, the District of Columbia and dozens of cities and counties around the country. Source of income protection is a valuable and legal tool that local governments can use to reduce economic and racial segregation. It’s a shame that the AAA doesn’t see it that way.